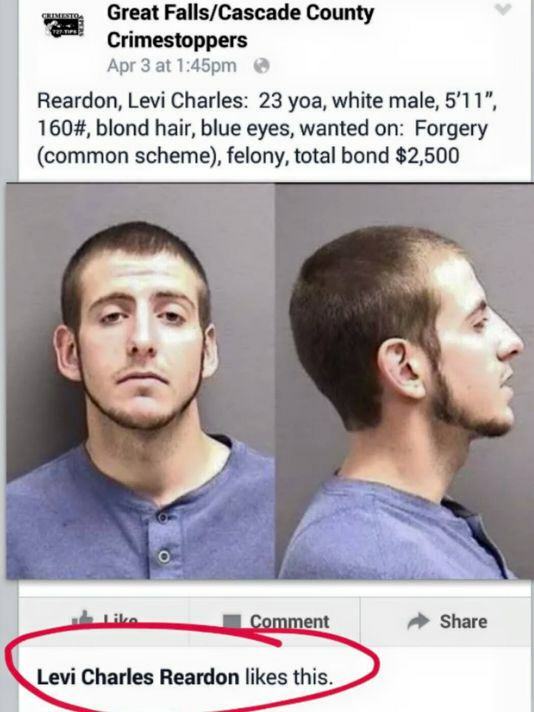 A wanted felon is languishing in police cells after liking a Facebook post of his mugshot on the Great Falls/Cascade County Crimestoppers Facebook Page. The man, Twenty-three-year-old Levi Charles Readon was wanted for felony forgery in Great Falls, Mont., after stealing a wallet and cashing bogus checks. He was arrested soon after his social media gaffe. Still on social media gaffes, a Judge in an unrelated case is challenging a formal rebuke she received after writing on Facebook about trials that she had been presiding over. The Judge from the State of Texas received condemnation over her actions in what her superiors feel undermined the Judiciary. The Judge received an order that she take four hours social-media classes. Failure to do so within two months she could face further action. The judge was involved in a high-profile case but was ruled a mistrial, leading to it being heard by a different judge.